Remember that one game with the fat cat that kept growing fatter and fatter as he continued to eat? It was called Sushi Cat and it has a sequel. Sushi cat 2 is a cutesy little pseudo luck based puzzle game that plays just like its predecessor, with a few shiny new bobbles. It features twenty-five levels, four power ups, and a cutesy storyline that actually provides incentive to play the game. the game starts out with sushi cat’s stuffed animal/girlfriend being taken by bacon dog. He tries to give chase, but finds himself unable to use the elevator because he can’t reach the button panel. Since he is conveniently in a grocery store, he decides to pig himself out in order to get big enough to reach the buttons, and this is where the game starts. Much like Burrito Bison, this game is very minimalistic on playing, and you spend more time watching than actually controlling sushi cat. 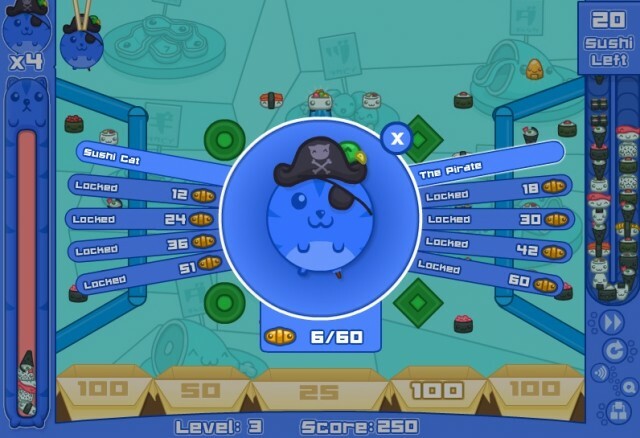 The difference is that sushi cat’s boards are laid out so that there is a huge amount of strategy in what amount to moving your mouse and clicking once. The wonky physics do add quite an element of luck to the game, but are generally predictable enough to accomplish your goals, be it collecting a power up, golden sushi piece, or just a mound of sushi. 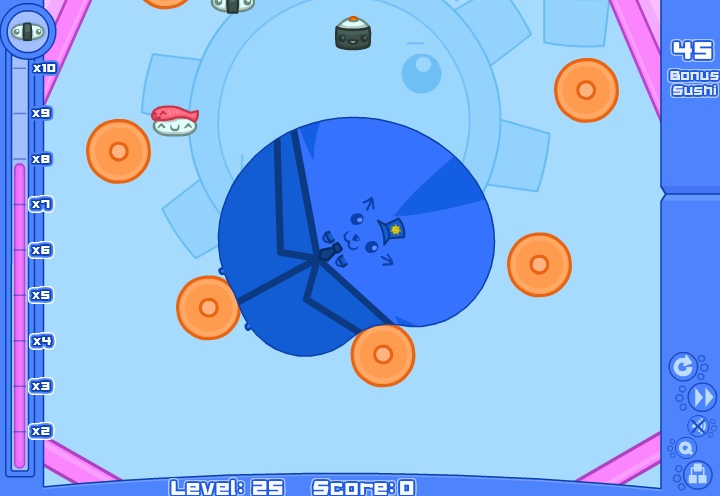 The power ups also add a small additional amount of control; bombs let you blow up sushi to collect it, the fist power up lets you charge through anything, including solid objects, the pinball power up lets you temporarily turn sushi cat into a game of pinball, and the shopping special lets you click sushi to collect it for a short amount of time. As far as the art goes, the game is unbelievably cute. If you can honestly look to the left and say that that cat isn’t cute, you have no soul. The cut scenes are like something out of a child’s story book. The sun, the mountains, the shopping mall and pretty much every other large inanimate object has a face, and the story can only be described with the word “d’aww”. Sushi cat isn’t a short game by any means however, its probably in the hour range for most people. It has 25 levels, and some of them (or maybe just the last one) will take multiple retries to accomplish. The power ups really speed things up, and give you a way to combat the physics engine’s constant toying with you. It’s not to say the game is difficult, but the most efficient route to getting all the sushi isn’t always obvious. Sushi Cat 2 game is a really enjoyable game to watch, though little player input is actually required. The game has a decent length without over staying its welcome, and its always fun to see just how big your cat will get. Definitely a worthwhile game if you have the patience to sit down and watch a get grow fatter and fatter on his way down a pachinko table. Sushi Cat 2 is a fascinating story, nice music and a cozy atmosphere.